Hill Road Studios are set within the South Downs National Park in the County Town of Sussex. 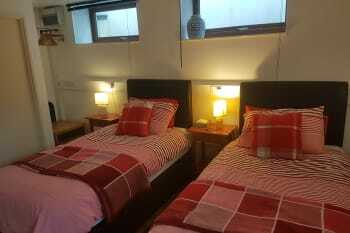 They are detached studio apartments with cooking facilities and en suite. Built to a high standard they have consistently achieved a four star rating with a silver award for service with Visit Britain and AA. State of the art heating controlled by the guest ensures comfort. 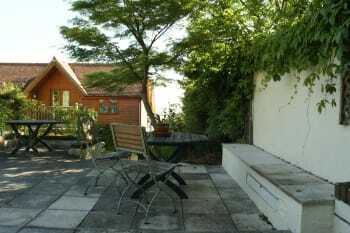 The studios are highly insulated which ensure peace and quiet The Garden Studio is set within the terraced mature garden and both studios have patio areas with seating for outside dining with tremendous views. Longer stays are available on an entirely self catering basis, many guest have stayed for a week, or a month. The beds have been carefully chosen, 1500 pocketed springs memory foam topping stitched firm edge hypo allergenic. 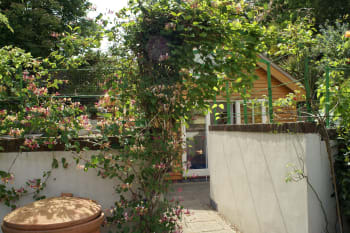 The shower rooms are large enough to shower and change in for mixed groups sharing, We regularly accommodate 4 in the Garden Studio with two extra Jaybee quality German made folding beds. Total rates, from Thu 25 Apr 2019, to Fri 26 Apr 2019, for 1 nights. Excellent, clean, well appointed accommodation which suited our needs. The owner Paul was friendly and helpful. He was there if needed but respected privacy at all time. Ideal for a B&B that the accommodation is separate from the main house. Lovely private garden area to enjoy the sunshine. 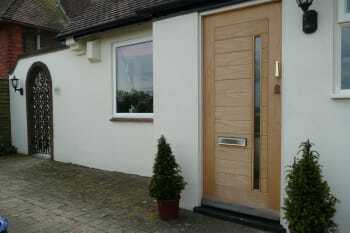 Situated 10 minute walk from centre of Lewes. Would not stay anywhere else if visiting Lewes again. 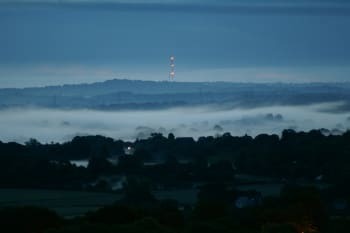 Located at a certain height above the town, gives views over the Downs. 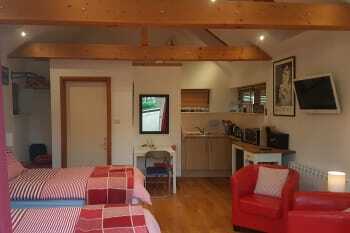 The studio is compact, clean, and well-stocked for breakfast but also equipped if the urge for self-catering appeals. The Studios would be a good 20-minute walk and climb from the station and the town centre. Lewes is compact, with many independent shops and hotels. Fortunately it retains the charm of narrow streets although this does lead to a one-way system which needs careful navigation. There is a good train service to London and other towns along the south coast, so could be a base for touring, especially for the walker. We felt very well in this apartment, and we will be happy to stay with you when we visit our son and family in Lewes. East Sussex is a beautiful, gently rolling landscape. In addition, the city of Brighton is definitely worth a visit. 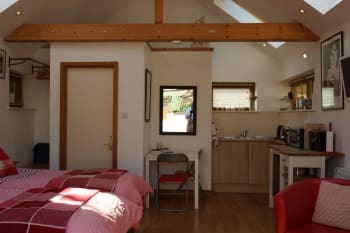 Superbly appointed, immaculately clean studio with all you need for a home from home stay, including tea, coffee, sugar, milk and a fine selection of breakfast ingredients, as well as a fridge and basic - but quite adequate - cooking facilities as well as pots and pans and all manner of cooking utensils. Large TV with free Netflix, super fast internet, and the hosts who live close could not have been more genial and welcoming, without also not being intrusive. I cannot recommend this place enough. Lewes is a lovely town with a good selection of shops, restaurants and supermarkets. Discovered excellent indian restaurant courtesy of Paul . Cant remember the name just the delicious food lewes is centrally placed to explore Sussex without the expense and hassle of Brighton A visit to the near by Amex stadium is a must if you follow "the world game "
We only stayed one night, so did not have the opportunity of truly appreciating the setting of the studio. We were met on arrival and the studio was very comfortable. We enjoyed our stay. Just a perfect 2 night stay for mum and myself, visiting Lewes for my sons wedding. We were very comfortable and our hosts most helpful. Impecable place! Out of our 4 week trip to europe and having done a combination of hotels and private rented properties, this was the best kept place. We only stayed one night because we went to a wedding, but we would surely have enjoyed it much more if we had had more time. It was extremely clean, the owners are super nice and the studio came with nice compliments such as tea, coffee, cereal and biscuits. Modern decoration also! Good location, 25 min walk into Lewes. 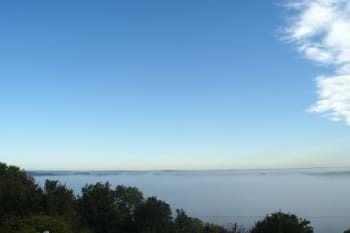 Also a short walk uphill to the south downs. An absolutely lovely little studio in a fantastic spot! The hosts Paul and Kathy are extremely welcoming and hospitable. Great place to explore the South Downs and Lewes/Brighton etc Thoroughly recommend! Excellent location, ideal as a base for the South Downs Way. Much more flexible than a traditional B&B with ample self catering cold breakfast items provided. Friendly and welcoming hosts. Bill’s restaurant/bar in Lewes town centre a nice place to sit ouside and watch the world go by! We were welcomed by Paul who was very happy to give us advice about walking in the area and places to eat etc. The room is large, bright and airy with comfortable beds and the location of the property is convenient, right on the Downs and close to Lewes. The bathroom was a little dated and breakfast was limited to some cereals and bread/jam/marmite but that suited us! Thoroughly enjoyed our stay. We found that unless you are looking for very traditional pub food -fish and chips/pies etc, the restaurants were limited. Some stunning walks in the area. We drove to Plumpton for a fabulous circular walk taking in Ditchling Beacon and another from Lewes centre to Glyndbourne. A great couple of days. Brilliant place to stay to see the region and Lewes. 5 min drive to Lewes centre or 30 min walk via picturesque route. Close to Black Cap with stunning views over countryside. Rooms clean and self-contained, including toilet/shower, TV, portable cooking hob, small ironing board and iron, small fridge, microwave and hairdryer. Paul is extremely knowledgeable about surrounding region and extremely friendly and helpful Highly recommended! Waitrose 5 min drive away and has free parking for 1.5 hours for customers. Flint Owl bakery close to Lewes is great if you prefer an alternative breakfast to that provided. Several small independent cafes in Lewes centre for breakfast. We were very comfortable. Wish we'd had time to spend on the lovely patios. Host was helpful and attentive. Breakfast supplies were fresh daily and studio was straightened daily. This is a clean, private location, away from busy streets. Twenty-minute walk to town is through residential areas. 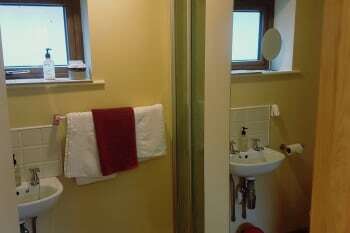 We especially appreciated that the heated towel rail actually works, unlike in so many places. We used local bus service to visit Rodmell and Charleston and can recommend those historic houses. Lewes has much history itself and is well worth exploring. We can recommmend the Royal Oak pub for lunches. Very comfortable place, and good facilities. The Pelham Inn is in walking distance and the food was awesome. The whole town though is filled with interesting nooks and crannies to explore. Easy train access to surrounding areas. A very impressive experience with all the comforts of home. I will certainly return when next in the area. Many thanks . Kathy and Paul are brilliant hosts and the accommodation and location are excellent. 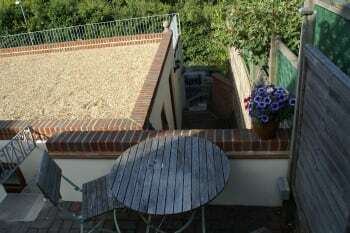 Well situated for Glyndebourne, the beach and good shopping. Very comfortable accommodation has everything you need for an overnight or longer stay. I arrived quite late but it was well lit and parking outside was ideal. Hope to stay again and get the opportunity to explore more next time. Nice place to stay,Paul is a perfect host; we´ll be back soon. Lovely clean room perfect for a night at Glyndebourne. Very small ensuite but good for one night. Breakfast in room cereal and toast which is great as you can have it when you want it. Everything very clean and comfortable. We stayed to go to Glyndebourne for which the location is excellent. While here Lewes is well worth some time and we enjoyed a sea walk before heading home. 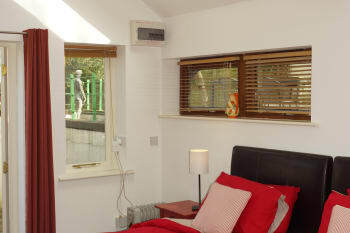 Tastefully decorated, compact studio that has everything you need, including breakfast provisions. I'd be very happy to stay again. Hosts so friendly, warm and welcoming, and a lift to the station was the cherry on the top. Great for Brighton, train which takes 10/15mins is so easy, and works out better value. Spotlessly clean. Everything you need for a scrummy breakfast. Very peaceful and quiet. Free parking. Pleasant stroll into Lewes. Should you find you've forgotten something there is a Londis about 5 mins walk away. Peaceful, secluded appartment a bit out of town. Nice private outside table/chairs at Garden studio for breakfast/relaxing. No 'living room' area, but comfortable bed and small kitchen facilities. Very welcoming when I arrived, room has everything you need and more! Love the different cereals and having fresh orange juice and coffees! Beautiful views from the top and very clean. I had a great stay! It was a fairly fleeting visit for me as I was going to a wedding so I didn't get to explore properly! I will, however, be making a return visit to Lewes! Having spent a year staying in both the Studio and the Garden Studio during mid week I can honestly say that the experience could not have been surpassed. Paul and Kathy proved excellent hosts. My stay was for business but I'm sure that it would provide an excellent base for anyone wanting to visit the attractions of the area. Restaurants:- Erevan Thai Restaurant, Bill's, AskItalian. Certainly visit Charleston Farmhouse. Working too much to see much else! Delightful accommodations! Meant to leave adaptor, they work only for devices that are suitable for dual voltage operation: 240 volt or 120 volt. I will probably paint landscapes from photos, can send you the image. Didn't mean to leave chocolate in fridge. Enjoy! We liked aqua italia for dinner, and the place across from Harvey's for breakfast. Nice walks through castle garden to Anne of Cleaves house. Fantastic place to stay. We had our own little beautiful house in the garden. It was clean and nice decorated and very comfortable beds. We could not have found a better place. The surroundings are stunning, and still your close to the center. Incredible hosts, Paul and Kathy they made us feel so welcomed. Great stay after a walk on the South Down Ways. I really hope to returned to see more of Lewes and to stay more days at Hill Road Studios. Lovely people,lovely place. I highly recommend Hill Road Studios to anyone who likes peace, tranquility and good quality accommodation. The bathroom window was umsatisfactory with missing handle. Also hot tap at the bathroom basin very stiff to turn off. A brief note about the shower hot water operation would be helpful. The quiet location was good and the beds were very comfortable,making a pleasant stay. Stayed in The Suite - Well presented room, continental breakfast cereal and toast in room. Tea and coffee makings too - plenty of fresh milk. Small en-suite, but all you need - macinator can be quite noisy and goes off randomly during the night. Could do with a mirror the main room. We had a comfortable able stay and would consider again. Most welcoming! An excellent place to stay - a pleasant walk from a wide choice of pubs and restaurants. Thank you for a wonderful stay - we loved the garden studio and the location was superb. Lots of great pubs in the town centre and lots of great places to eat - make sure to make the most of them. Just a couple of negative comments. In the sugar there was bits of something else and the bath towels were really small. It would of been nice to find some bacon and eggs in the fridge. Our weekend was exceptionally hot and the studio would have benefited from a fan and cotton bedding. We supplemented our breakfast which would otherwise have been disappointing. Lots of good restaurants in Lewes, advised to book in advance at the weekend. We had a lovely stay at the Hill Road Studios, facilities were excellent and everything was very comfortable. Very warm welcome by the owners. Everything was good! Great spot with everything you need. Only quibble was the sound of the water sanitiser in the bathroom. Thank you for the note about the sanitiser, which we have now replaced and is much quieter now. very clean well set up accommodation, perfect for our needs. but if using for longer due to high windows no exterior view. and shower was " English" at its worst, very low flow rate. We checked the flow rate of the shower and found it was set to "VERY HOT". This does reduce the flow rate. When we set it back to a normal temperature setting the flow rate was more than adequate. Any future guests please do let us know "in the moment" and we can address issues like this. We had a very pleasant stay and enjoyed al fresco lunches on the charming garden terrace, with lovely views to the South Downs. 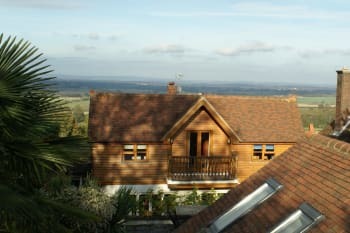 Hill Road Studios are an excellent base for exploring the Sussex countryside and spectacular coastal paths. We found it very convenient for a visit to Glyndebourne. Lewes is a an interesting and attractive county town which is very walkable - weather permitting - we were lucky! 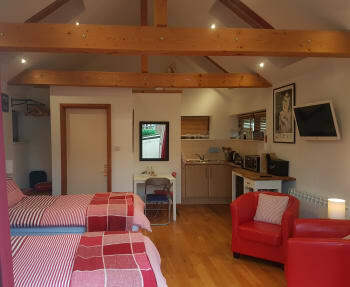 Fantastic to have a completely self-contained B&B unit with all one needs for a simple, continental breakfast on site. Really well fitted out and furnished. We would definitely stay here again! It's a ten minute walk from the centre of Lewes which is fine if the weather is good. But we had no difficulty finding a car park in Lewes when we needed to. We used this as a base to visit Ditchling Museum of Arts & Crafts, Lewes Castle, Alfriston Clergy House (NT), Charleston Farmhouse, Monks' House (NT) and Bodium Castle. We recommend the restaurant Famiglia Lazzati in Market St, Lewes, for great Italian food at a very reasonable price. Very well appointed garden suite located on the edge of town. Hosts were pleasant and interesting. A besutiful location with stunning views. 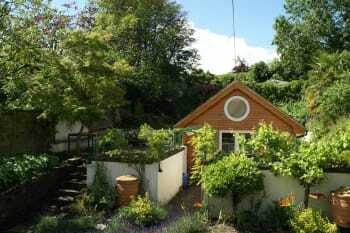 Garden studio is just lovely, very well furnished and equipped. The host are very friendly and care about the little details making sure their visitors have everything they need. We will most definitely be back. Fantastic self-catering B&B. Well-appointed and cared for, good value, and booking etc very efficient. Would not be suitable for people with limited mobility but otherwise would recommend to anyone. We stayed for a couple of nights in the Garden Studio and were made to feel very welcome by the friendly owner. It had everything we would want from self-catering accommodation with the added bonus of having breakfast supplied within the Studio to enjoy at whatever time we chose, and in private. 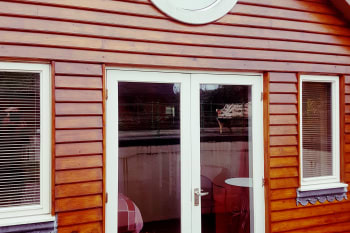 It’s very spacious, clean and comfortable and with two patio areas available to use it was a perfect little hideaway. We stayed in Lewes for a wedding so didn't get to look around as much as we would have liked, but would definitely stay again. Lovely self contained with everything you would need for a short stay. Paul was a great host and kindly gave us a lift to the station as it was pouring with rain. Thoroughly recommended for a stay in Lewes . 10 minute walk to town centre , offering views of the Downs and countryside. Privacy is respected and there are outside areas to sit and relax. Try Bills Cafe for atmosphere and Flint Owl Bakery for coffee , bread and cakes. Beautiful place, the studios are well designed and adequately equipped - we thoroughly enjoyed our stay. We used the studio as a base for going to Glyndebourne. This was a much better location that our previous trip when we stayed in Brighton.